A few months ago I posted on here about my acceptance to this great summer opportunity, the Sō Percussion Summer Institute. It’s a two week event, and I’m right in the middle of it all and it’s been a fantastic experience thus far. Tonight I have the privilege to premier a piece by Michelle Nagai with Kelsey Tamayo. This evening’s program is entirely focused on composers at or affiliated with Princeton University. It looks to be a good show. I can’t wait to see what everyone has been working on over the past week. Working so closely with composers is not something we get to do all that often. And now here we are, getting hours with composers in the room! Being in this environment is really quite surreal. It’s great. More on that to come. Right now it’s show time. I’m always finding great things on newmusicbox.org. Here’s a percussion focused mix tape from earlier this year. Good stuff. 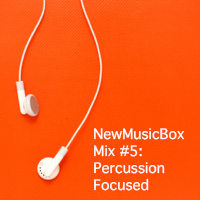 NewMusicBox » NewMusicBox Mix 5: Percussion Focused. Duo Recital is only a few weeks away! Vinao- Book of Grooves, Mvt IV.